Week 2. We received a second section of keel, some more frames and a few other odd bits. You will note that part 6 doesn't have the tabs at the top that the drawing shows. The part is correct and the magazine is wrong according to Hachette customer services. All I did this week was join the 2 sections of keel, and placed the bracing piece, part 10, on one side only. This is so I can construct the keel in one flat piece before I start attaching the frames. 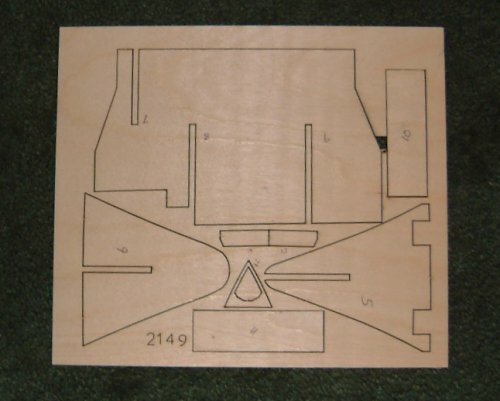 Use a steel rule to line up the bottom of the keel when you glue the bits together. A word of warning. You will have to keep the keel flat and pinned or weighed down until it is complete and the other side braces are fixed, otherwise there is a chance that the keel will bend, which is just what we must avoid. You can glue the braces both side, and that will reduce the chance of the keel bending, but it will make it a bit harder to line up the pieces. You will also need to keep the off-cuts as packing pieces. Find a box to keep all your bits safe. There are a few bits we don't need yet, and we don't want to loose them. It looks like we should get the fore deck and a couple of other small bits.